This Ventana LE 4002 will have you relaxing in luxury each time you take it out of storage. The kitchen offers everything the cook will need to make meals for a weekend or everyday if you choose not to eat fast food. Just imagine visiting with other camping friends on a hot summer day in the main living area. 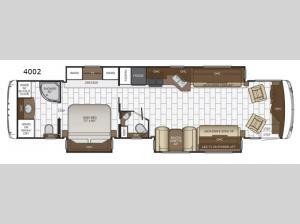 You can offer them seating on the 92" jack-knife sofa, the 74" jack-knife sofa, the captain's chairs that swivel, and the booth dinette all while watching the LED TV on a power lift. The sofas and dinette also offer extra sleeping space for the kids or grandkids. The walk-through bedroom provides a cozy queen bed, storage, another LED TV, plus access to the rear full bathroom. Come see other highlights like the space saving doors, the radius shower, and the half bath.